I’m so excited!! 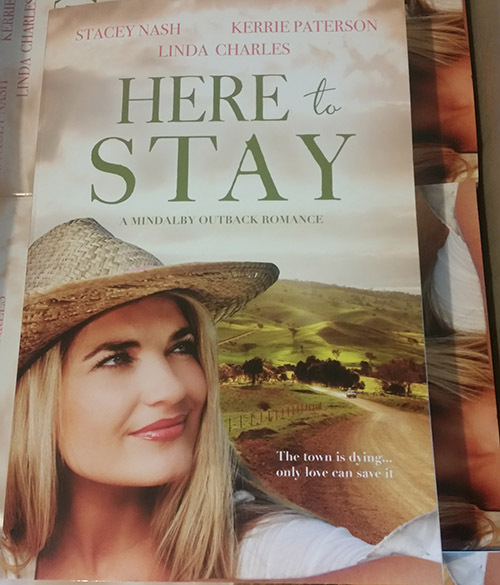 My author copies of Here to Stay arrived today – an event which involved leaving the house, driving to the Post Office to collect them – and then standing in the carpark ripping open the box and grinning like a fool at the sight! It’s a dream come true to be able to hold a print book of mine in my hands! And now it finally feels real and exciting! The next level in the excitometer will be when I see it on the shelves in the bookstores next month (end of this month if they decide to shelve them early). I tried a dozen times when I got home to get a selfie with the book – but I’m almost 48, not 14 and I don’t have the selfie skills. And I have way too many chins and not enough co-ordination to hold my head at a flattering angle (if I can find one! ), hold the book and take the photo all at the same time. I needed a 3rd hand! 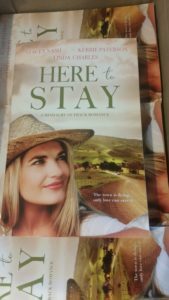 There will be a few competitions coming up where you can win a copy, run by myself or my co-authors Stacey Nash and Linda Charles. So keep an eye on our social media to be in the running!